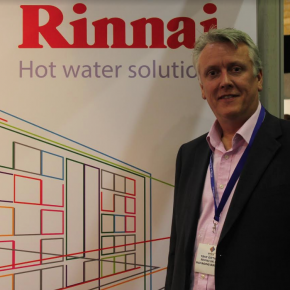 Tony Gittings, MD of Rinnai, a global leader in the manufacture of hot water heating units and systems, believes it is the end user that is emerging as the determining force in making changes to suit today’s demands and expectations. “In the past several years we have seen some extraordinary changes in our little patch of the wide heating and plumbing arena. “Gone are the established supply lines, gone too, is the dominance of the ‘traditional’ products in the supply of hot water in commercial and institutional sites. “Water is the stuff of life, simple as that. It is a very precious commodity that is the foundation of our entire quality of life. In 2013 the Energy Savings Trust completed and issued a major report titled ’At Home with Water’. “The report detailed our domestic use of water. It came up with some stunning figures re: the amount of water used domestically – each person uses approx. 140 litres of water daily with the average household using almost 350 litres per day. “Just think of a one litre bottle of water, then multiply it 350 times – it’s a huge amount and it is not decreasing. “One of the biggest water companies has a consumption guide on its website and it estimates that just one person will use almost 180 litres of water daily. “A quick website also shows the per person consumption of hot water when they are away from home. When someone stays at a hotel or hospital, they consume 160 litres of hot water each day! Offices use a measly 22 litres in comparison! “So, there is no doubt that hot water consumption is rising and, given the rapid development of techniques building energy efficient homes which require less than 10kW heating, means that hot water provision is getting more and more driven by the end user. “At the moment, domestic hot water provision is provided via the boiler, usually a combi type, although those homes with renewables tend to use a water heating appliance as an auxiliary supplement. “But the biggest development in the last few years has been the launch of installing companies which are wholly and totally based online. These typically give the consumer a quote, a date for installation and provide finance. “The installer is given a date and time to do the installation – no buying of materials – the domestic heating marketing is now thinking inside the Box because of innovations like Boxt. “It really does look like the days of box-shifting are gone. “Commercial systems of hot water provision come mainly via the traditional style ‘stored’ system – or the Rinnai continuous flow method where hot water is delivered instantly, economically and efficiently in an engineering sense. “But the consumer and the installer – domestic or commercial – are beginning to demand a complete service now. We have seen and even anticipated these changes. “Rinnai has made considerable financial investments in the two critical areas of any commercial enterprise – high quality of products and service excellence aimed solely at the installer and their end user. “We espouse the concept of complete system efficiency in terms of hot water delivery and we practise that every single working day. “Our products are of the highest possible quality, offering long term, robust performance giving useable hot water on demand at the turn of a tap, all at an economic and energy efficient level. “Coupled with that is our service – we have a dedicated salesforce dealing directly with installers, contractors, designers, consultants and facilities & estate managers. “We have very deliberately aimed the bulk of all marketing communications direct to these sectors offering instant technical support, design service, comprehensive training courses at either our own tailor-made facility or at a venue of a customer’s choice. We have also initiated five accredited CPD courses. “We believe that we are the best value-for-money units and systems of hot water delivery currently available to the UK commercial and residential market.